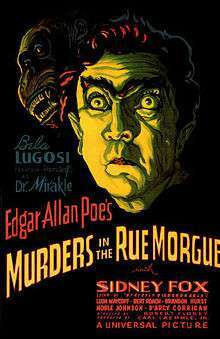 Murders in the Rue Morgue is a 1932 American Pre-Code horror film, very loosely based on Edgar Allan Poe's short story "The Murders in the Rue Morgue". Bela Lugosi, one year after his performance as Dracula, portrays a lunatic scientist who abducts women and injects them with blood from his ill-tempered caged ape. Karl Freund's cinematography and Robert Florey's direction have been praised by critics and characterized as "expressionistic" by Leonard Maltin. Despite the film being pre-Code, violent sequences prompted Universal to cut its running time from 80 minutes to 61 minutes. This film was produced as a compensatory package for Lugosi and Florey, after both were dropped from 1931's Frankenstein. Lugosi had originally been cast as Dr. Frankenstein, and the film was to be directed by Florey, who had been developing the coveted project. Lugosi was subsequently demoted to play the mute monster, however, which he claimed to have turned down. Florey was replaced as director by James Whale, as producer Carl Laemmle was both unsatisfied with Florey's work on the project, and had given Whale first choice of any Universal property at the time. The box office results for Murders in the Rue Morgue were disappointing, and Lugosi's original Universal contract for Dracula was not extended. Today, however, the film is generally well-regarded by critics and is considered a cult classic. In Paris in 1845, a mad scientist, Dr. Mirakle (Bela Lugosi), abducts young virgin women and injects them with ape blood, in order to create a mate for his talking sideshow ape Erik (Charles Gemora, the gorilla performer). Young Pierre Dupin, a young naive medical student and detective (Leon Ames — credited as Leon Waycoff — in the role of Poe's standard detective icon, C. Auguste Dupin), his fiancée Camille L'Espanaye (Sidney Fox, in the role of an original character in the short story), and their friends Paul (Bert Roach) and his girl Mignette (silent film actress Edna Marion, in her last film role) visit carnival sideshows, including Mirakle's sideshow, where he exhibits Erik. Both master and servant are enchanted by Camille, whom Mirakle plans to become Erik's mate. He invites her to come and take a closer look at Erik, who grabs Camille's bonnet. Dupin tries to get it back, when Erik tries to strangle him. Mirakle backs him off and offers Camille to replace the bonnet. But Camille is reluctant and suspicious to give the doctor her address, so, when they leave, Mirakle orders his servant Janos (Noble Johnson) to follow her. Erik enters Camille's room, with the shadow of his hand appearing over her head. One of Mirakle's victims, a prostitute, is found dead in a river (a homage to another Dupin-Poe tale, "The Mystery of Marie Rogêt"), and is fished out and taken to the police station. Dupin wants to examine the girl's blood, but the morgue keeper (D'Arcy Corrigan) won't allow. A bribe convinces him to draw some of the blood himself and deliver it to Dupin the next day. Dupin discovers in the blood a foreign substance, also found in the blood of other victims. Mirakle visits Camille and asks her to visit Erik again, but when she refuses, he sends Erik to kidnap her. Dupin happens to be passing out of the flat, hears her screams, and tries to enter the room but it is locked. The police arrive when the ape has already retreated and Dupin is arrested. Neither Madame L'Espanaye (Betty Ross Clarke) nor her daughter are found. The police prefect (Brandon Hurst, in a role based on the character G—from Poe's Dupin stories) interviews three witnesses: Italian Alberto Montani (Agostino Bogato), German Franz Odenheimer (Herman Bing) and a Dane (Torben Meyer). All of them state that they had heard Camille screaming and also someone else talking in a strange language (the German thinks it was Italian, the Italian thinks it was Danish and the Dane thinks it was German). Camille's mother is found dead, stuffed in the chimney (the fate of Camille herself in the original story), and her hand clutching ape fur. Dupin points out from the fur that Erik himself may be involved. The police, along with Dupin, run to Mirakle's hideout. Before they arrive, Erik turns against his master and strangles him. He grabs Camille when the police arrive and they chase him. The police shoot Janos in the back when he tries to keep them at bay. Erik, pursued, is cornered on the roof of a small dockside house. He confronts Dupin, who shoots the animal dead and eventually saves his fiancée from the peril. A print is preserved in the Library of Congress collection. ↑ "Murders in the Rue Morgue (1932)-Overview". Turner Classic Movies. Retrieved January 19, 2015. ↑ "Murders in the Rue Morgue (1932)". classic-horror.com. Retrieved January 19, 2015. ↑ "Murders in the Rue Morgue". rottentomatoes.com. August 21, 2014. Retrieved January 19, 2015. Wikimedia Commons has media related to Murders in the Rue Morgue (1932 film).